Night Contact partnered with Photoworks to offer a £2,500 grant towards one new site-specific collaborative work to be the focus of the 2nd edition of the multimedia festival taking place 18 October 2014 as part of Brighton Photo Biennial (BPB). 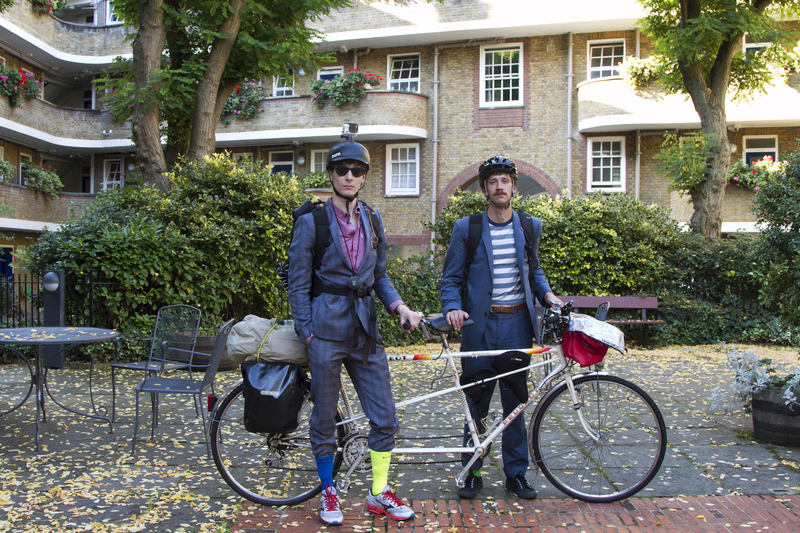 We are thrilled to announce our commission winners Tom Pope and Terrence Smith who will create an experimental film, Silent Fore to Aft, charting their seven-day journey between London and Brighton by tandem bicycle. They will apply strict rules to their journey, including not speaking to each other, turning their collaborative journey into a performative event. The work will premiere at the festival between 6-10pm at Circus Street Market in a specially designed truck trailer. The following day (19 October) at 2pm, Tom Pope and Terrence Smith will hold an artist talk about the project at Grand Parade. Read an interview with the artists here. The team at Night Contact are excited to share with you our programme for 2014! In Jubilee Square the work of invited artists will be displayed, linking to the festival’s theme of collaboration, authorship and influence in relation to the photographic image and the screen. Featured work includes Caribbean Spirit by Jason Fulford, Hometowns by John Maclean, Things (Winter) by Ben Rivers, Chimney from Chimney, Lamp & Fire by Taiyo Onorato & Nico Krebs, Double Act by Isabelle Wenzel & Michel Kouider, Dance (All Night, Paris) by Melanie Manchot, Almost There by Aleix Plademunt, and Songs of Innocence and Experience: A Study Guide by Rick Pushinsky. An open submissions project will be showcased in four slideshows also at Jubilee Square from 7-11pm. Four curators – Thurston Moore (musician & writer), Esther Teichmann (artist), Rebecca Norris Webb (photographer & poet) and Anne Bourgeois-Vignon (Creative Content Director, NOWNESS) – each selected a line of text with personal resonance for photographers to respond to. Entrants submitted images for one of the four texts, and in turn each judge selected and curated a selection of the submitted images into a slideshow. Each slideshow is a visual representation and interpretation of the curator’s original text. In Jubilee Street between 7 – 11pm there will be the first UK screening of Jason Lazarus & Eric Fleischauer’s feature length film twohundredfiftysixcolor. Crafted from over 3000 animated GIFs, the film charts the GIF’s evolution, exploring connections to early cinema and the contemporary cultural, political and aesthetic possibilities offered by the ubiquitous medium. At The Basement Club on Kensington Street from 6-11pm, EXTRAMISSION: On the research of Professor J. Hillard by the ARKA group will be screened. Along Grand Parade a series of window screens on rotation will show FROWST by Joanna Piotrowska, Recognition by Manuel Fernandez and The Window by Bjørn Venø. A detailed programme will be available shortly.